Stock status is current as of 4/23/2019 8:18 PMET. Enjoy impressive visuals with the LG 65" Commercial Lite Integrated LED HDTV. Packed with 1080p resolution, an almost endless variety of vibrant colors and sharply bold images practically leap from the 65” display. With two HDMI ports, enjoy connecting two of your favourite devices to this LED HDTV at once. Its 240Hz refresh rate lets you enjoy action packed videos without any lagging. Multi IR function eliminates the remote control signal interference between TVs in multiple dwelling rooms. 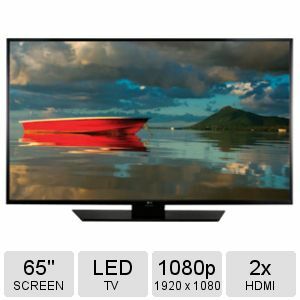 Buy LG 65" Commercial Lite Integrated LED HDTV today! 57.5" x 33.4" x 2.3"
57.5" x 35.4" x 11.6"